This is the Virtual Tabletop files it does not include the Print Yourself Version. The Tile are 140 dpi. Modern Lab 6 x 6 Tiles includes 40 6” x 6” unique, modular tiles for use to create a modern or near-future science fiction laboratory. This tile set features an even mix of connective tiles and destination tiles. 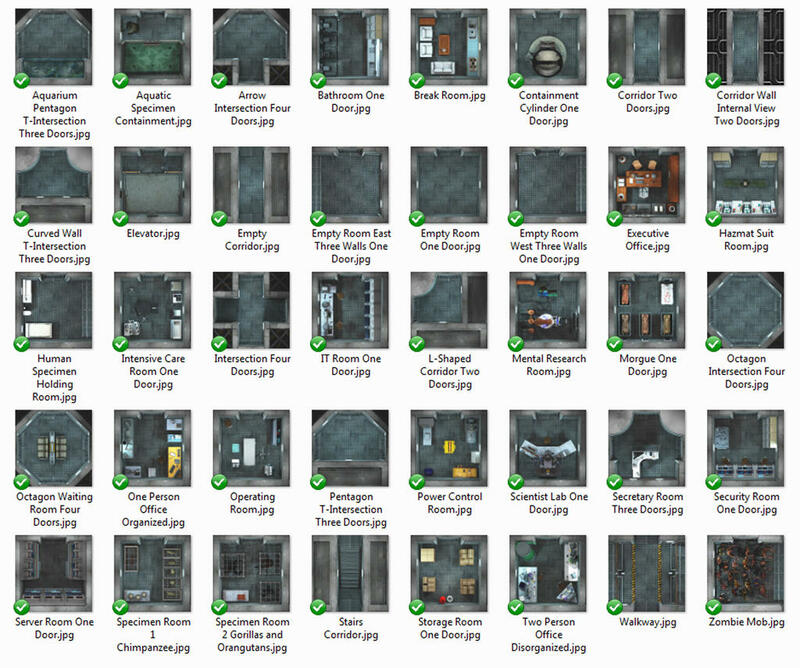 Modern Lab 6 x 6 Tiles is intended for use in modern, near-future science fiction, and horror games. Weaponized Zombies: Scientists have been told they are working on a cure for the zombie virus. They are experimenting on zombified chimps, apes, and humans. They have been injecting the zombies with various biological, chemical, and even radioactive attempts at a cure. Broly Labs isn’t interested in a cure. They are interested in making weaponized zombies and selling them to the highest bidder. Their CEOs have been manipulating the data by having their IT techs change the information given to the scientists. Unfortunately for the scientists, their latest attempt at a cure has changed the zombies completely. They can now phase out when shambling around (becoming invisible and passing through objects). They only become visible again when making attacks or standing still. The zombified humans, apes, and gorillas escape and start eating the scientists. The surviving scientists need to run away and try to use their only available weapon, their brains, to figure out how to slow down the zombies and escape the lab.